Hugh Grant lends his voice in the latest animated film from the people who brought you Wallace & Gromit. 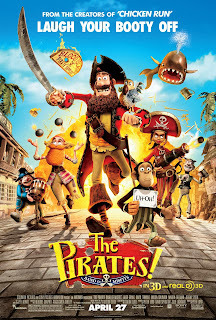 The Pirates! Band of Misfits is a story about a relatively tame and wildly unsuccessful pirate named Pirate Captain, and his crew who are equally inept. Every year the Pirate King who is dressed like Elvis, gives an award to the pirate who brings in the most booty. Pirate Captain who's crew sincerely adores him are excited when he explains since he always loses this year by default is his year to finally win the trophy. while he's ready to submit his application we see who he's up against. Cutlass Liz voiced by Selma Hayek as the hot but deadly and more dangerous female pirate. Black Bellamy known as the best pirate out there and voiced by Jeremy Piven, is showy but its clear everyone thinks he's number one. In his quest to get the most booty, he by chance since he's such a bad pirate end up meeting Charles Darwin and his monkey BoBo. Charles is madly in love with the Queen Victoria Regina who hates pirates with a blazing passion. Now I've always liked Wallace & Gromit the humor works for me although C1 does not care much for it. She was laughing during most of this movie. There were some moments where the jobs went over her head, plus while waiting for this movie to start we had a lively conversation about who's better Pirates, Ninjas or Chuck Norris. The writing is smart the storyline is good and its funny. We did see it in 3-D and it was respectable. Probably since its animation its easier to film and actually have things feel 3-D on the screen. I don't think it was needed, but it was at least done well enough. I laughed quite a few times, but found myself smirking more because of the jokes. I give this movie a Matinee. Its a kid's film at its heart that's the target audience and its a good film for the age 7 and up since there is potty humor. younger kids should sit through it fine as it clocks in around 90 minutes, its a dialog heavy film but still a silly funny in parts there weren't too many children at the screening so i heard a ton more adult voices. As a parent if you find a Wallace & Gromit episode acceptable, this is OK as well. Pirates! Band of Misfits is Rated PG.